Christmas has come around very quickly for us, but to be honest we have to get into Christmas mode as soon as we return in January. This year we were asked to create the theming for three of the biggest Christmas events in the region. The Ricoh Arena commissioned us to create the entire theming for their ‘Speakeasy’ Christmas – Coventry’s biggest festive parties – a prohibition-era style event that will be held over four nights. Levy Restaurants at the King Power Stadium, home of Premier League Champions Leicester City FC, also asked us to provide all Christmas promotion for their own parties over nine nights. 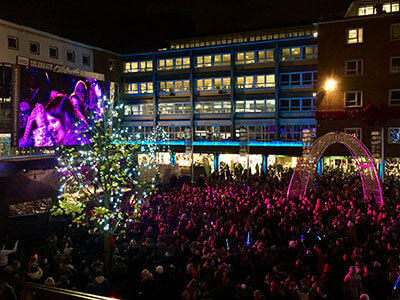 But the biggest single event that we have been involved in was Coventry’s Christmas Light switch-on which saw over 15,000 people turn up to see a host of musical and dance acts, topped off with a performance by the X Factor’s Fleur East. We created a ‘NOEL’ Christmas campaign that covered four huge events provided by the Coventry Business Improvement District (BID), one of which being a month-long Christmas village.